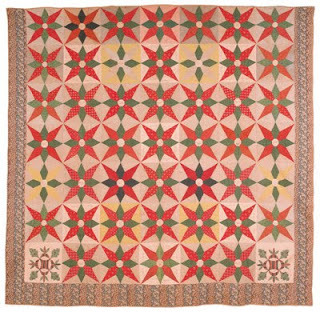 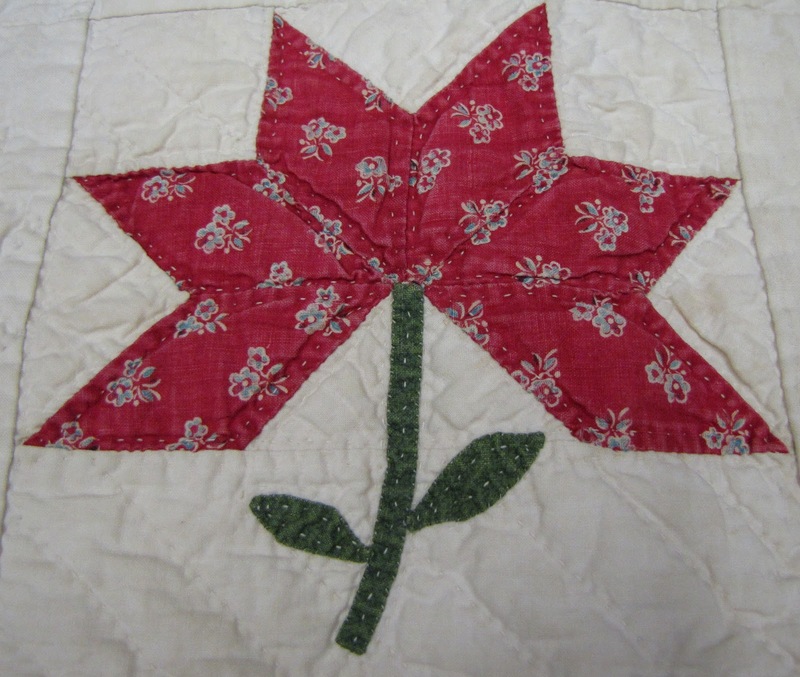 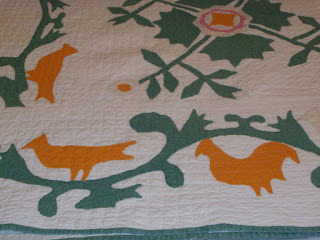 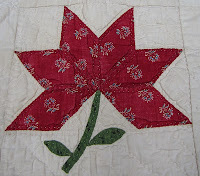 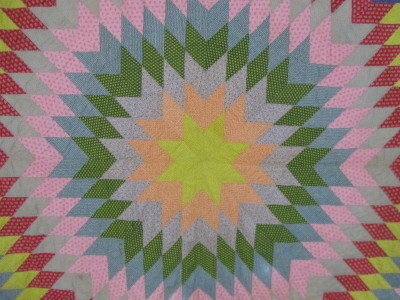 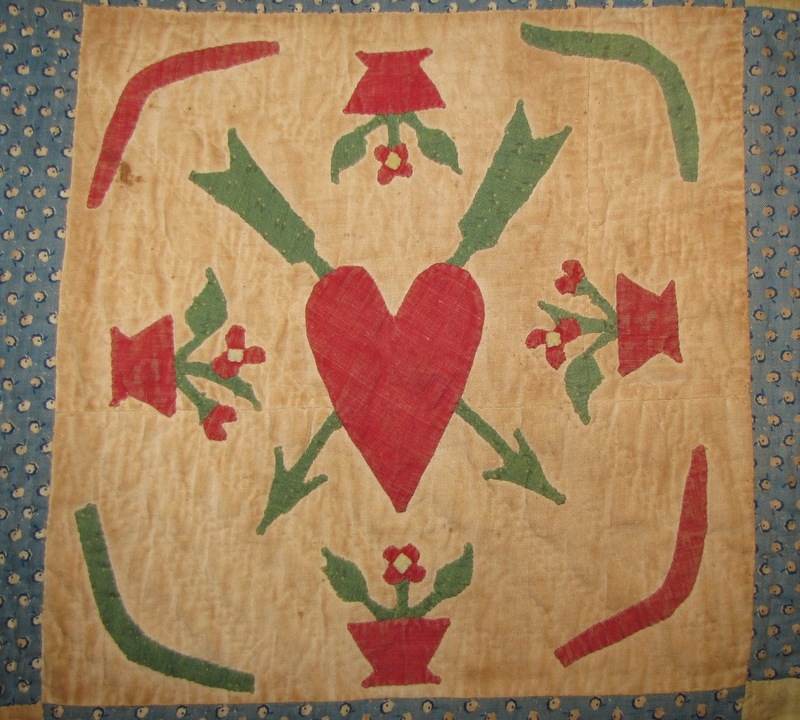 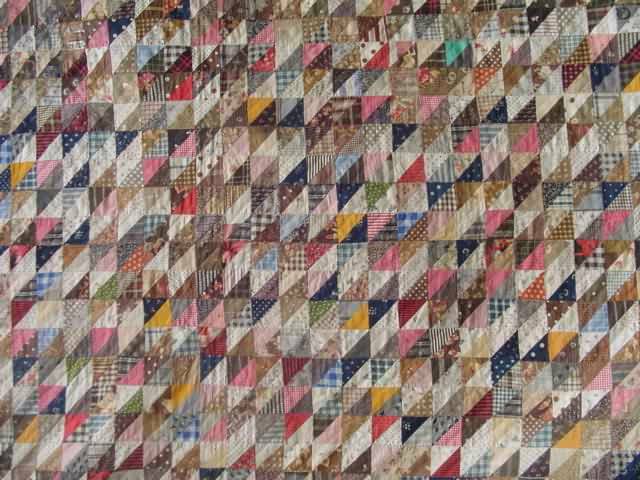 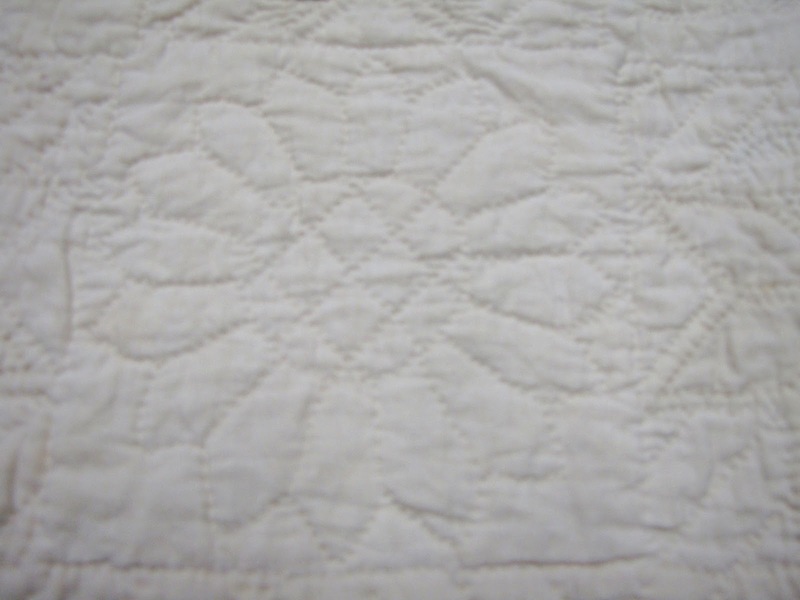 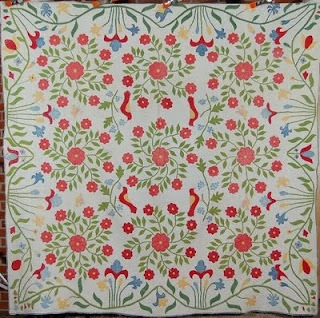 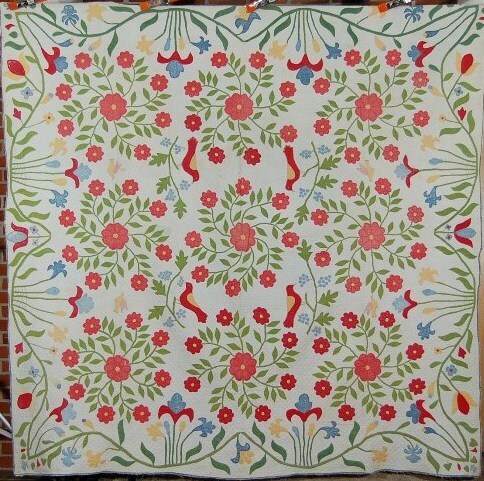 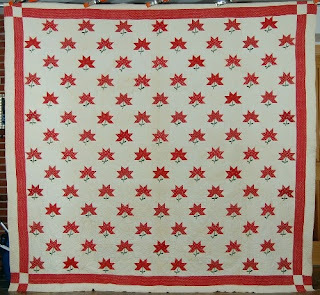 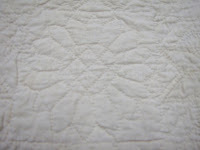 Here is one of my favorite quilts, a Bethlehem Star, circa 1850 from Pennsylvania. 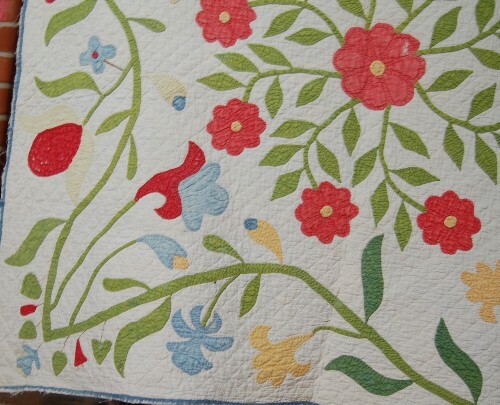 One can't help but smile when looking at this quilt! 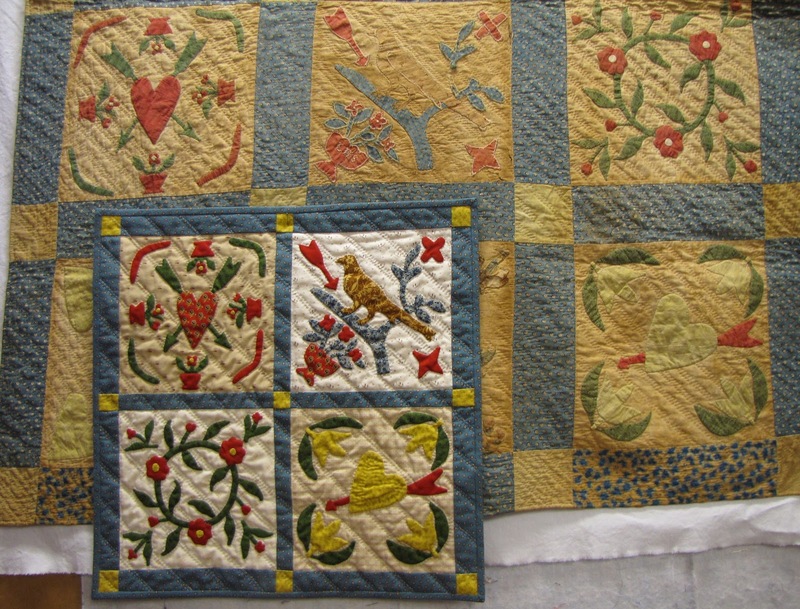 Part of my antique quilt trunk show, Quilt Masterpieces. 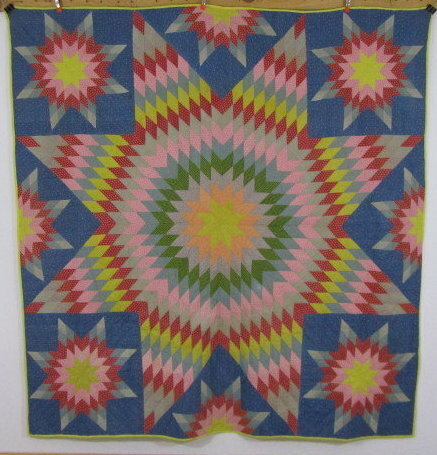 From the eBay listing: "An amazing rising sun quilt with satellite stars and deep blue print background. 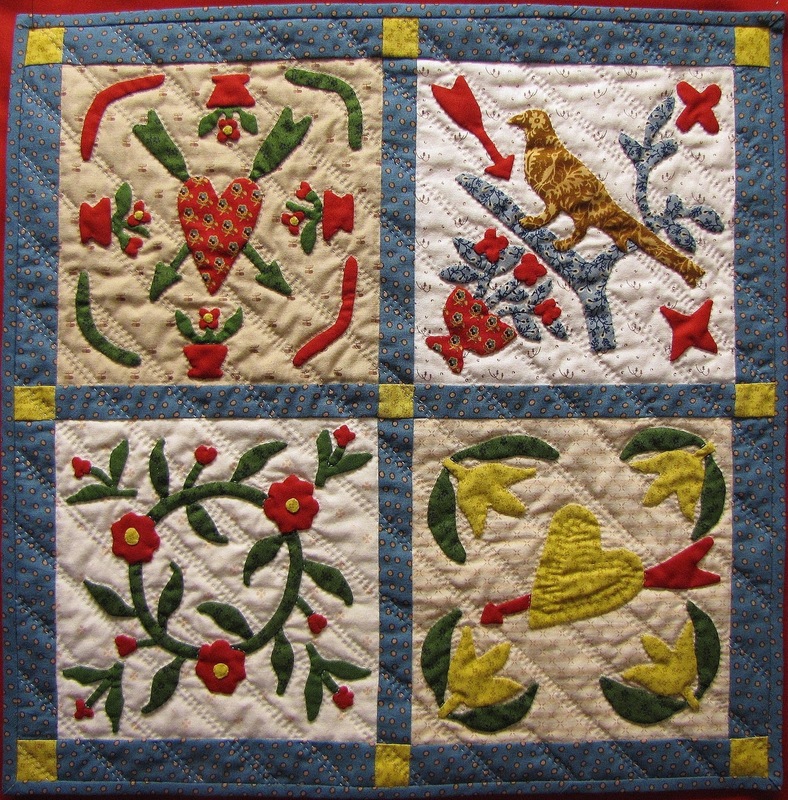 I love the way this quilt was designed with the blue background. 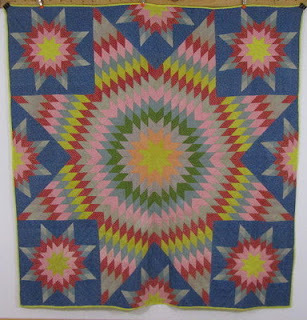 The center star floats against a blue background sky." 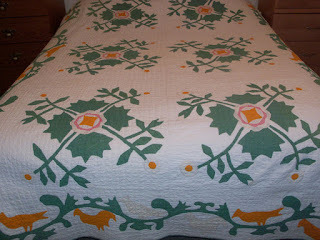 Note: the quilt top is from around 1850 BUT it was finished much more recently probably in the 1940's or 50's. That is when it acquired that wild yellow backing. 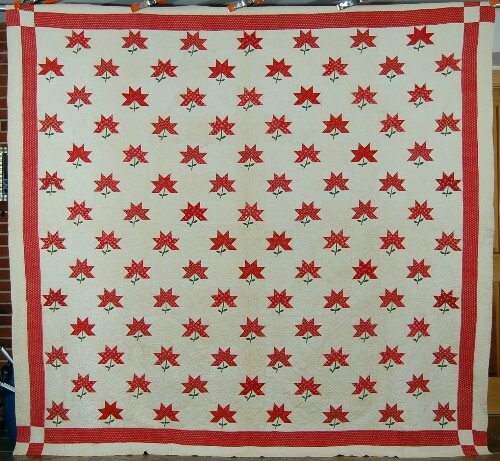 http://www.allianceforamericanquilts.org/, click on link "View, vote, bid! 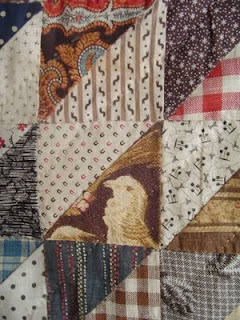 Viewer's Choice Voting" and on next page click on "View, Vote, Bid" to get to the survey. 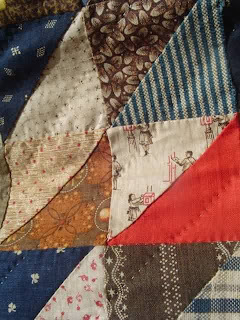 Again it is number 117. 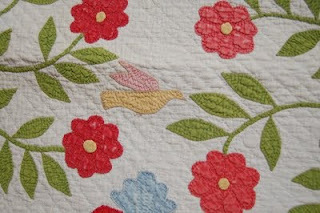 This contest is separate from the springtime voting (I am thrilled to say that I won 3rd prize in that voting). Thank you for the support. 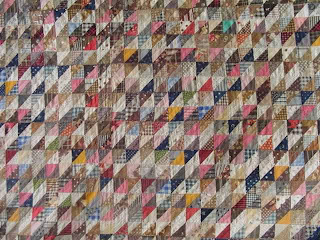 Virginia is for Lovers, reproduction quilt, 2011, 16" x 16"
To learn more about both quilts, put crib quilt or Virginia in the search box. 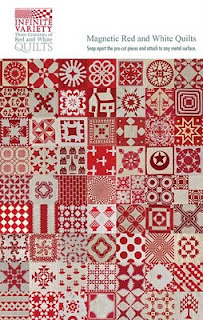 Due to the major Red and White Quilt exhibit: Infinite Variety: Three Centuries of Red and White Quilts that is about to open in New York City sponsored by the American Folk Art Museum, there is a heightened interest in all things Red and White. 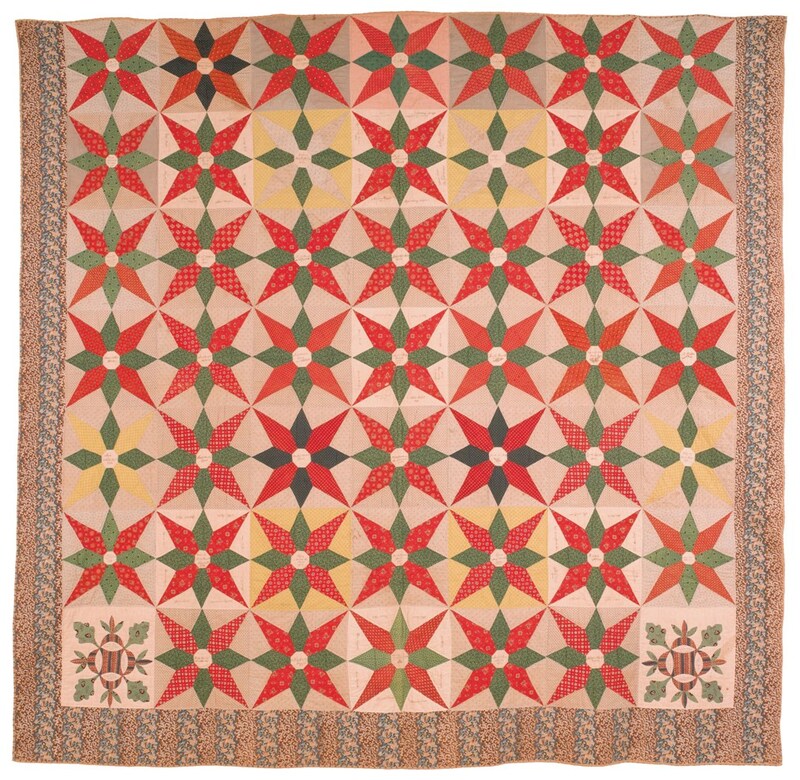 "The largest exhibition of quilts ever to be held in New York City, the installation will include 650 American red and white quilts from the private collection of Joanna S. Rose." 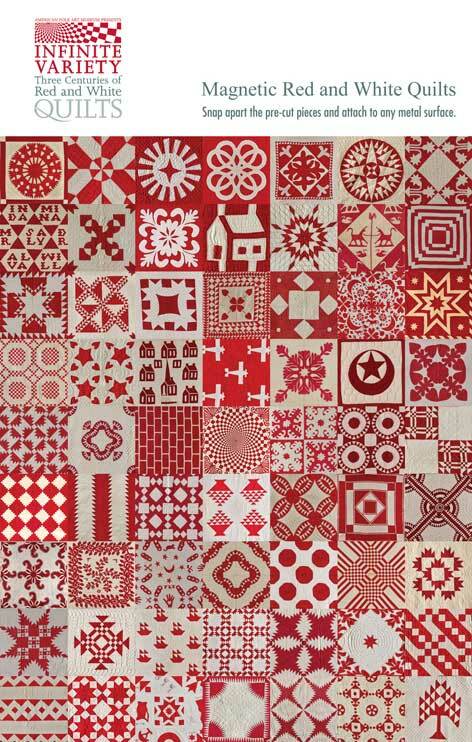 What an amazing collection, unrivaled in focused breadth, I daresay. 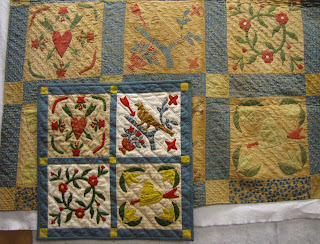 Volume, volume, volume and yet incredible unique quilts. 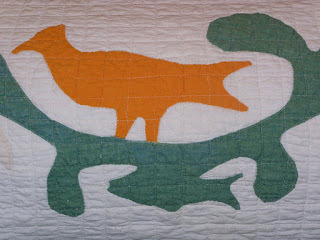 Taryn has organized an online exhibit and the 1st photo shows my contribution. A graphic red & green peony quilt that is hand pieced, hand appliqued, and hand quilted, with early fabrics dating from 1830-1850. 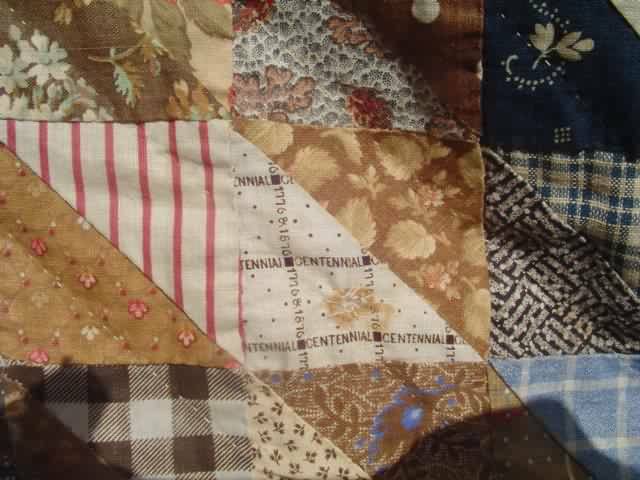 This quilt is from the pre- civil war era. 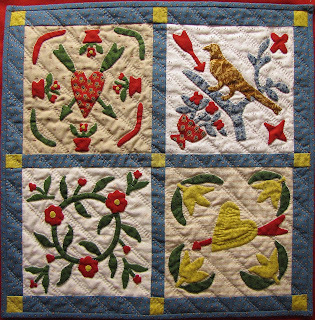 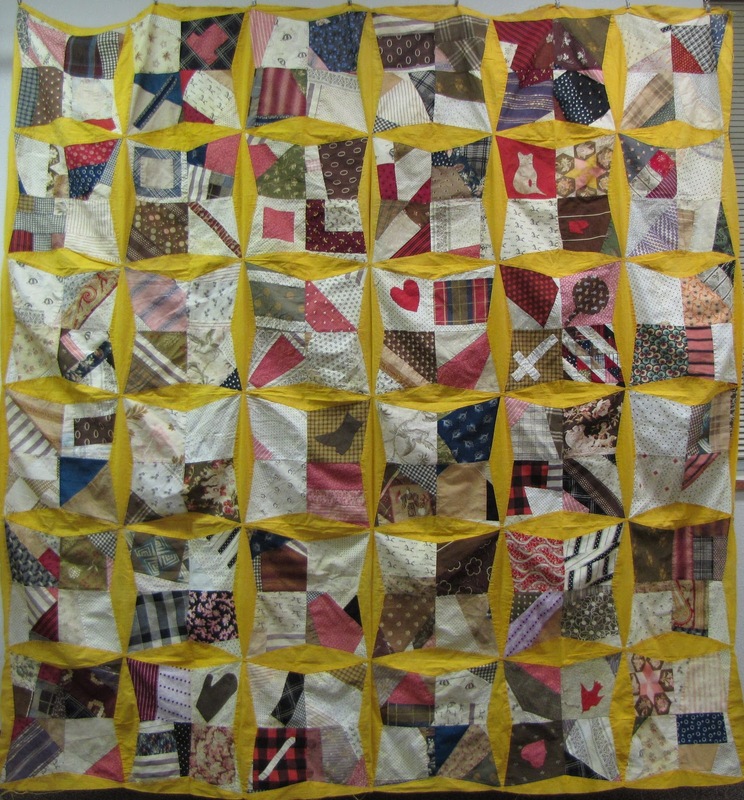 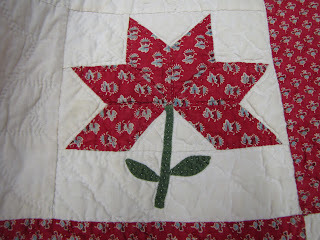 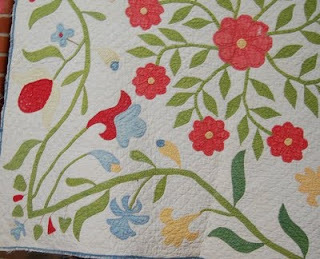 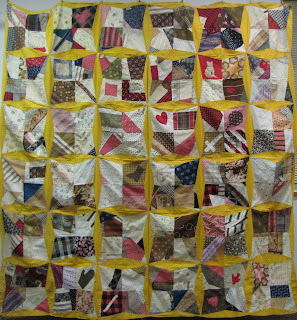 The quilting is wonderful, with quilting around the piecework and in elaborate straight line, feathered, maple leaf, and sunflower designs in the background. 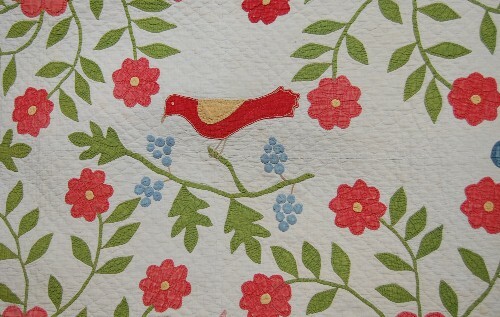 And it almost goes without saying the turkey reds are absolutely amazing. 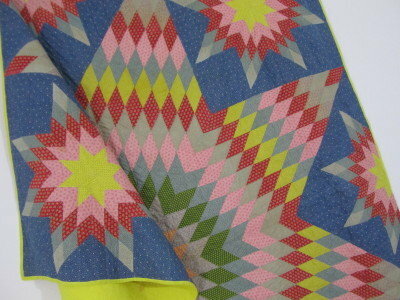 I'm only showing the ones with blue right now but there are several with yellow motifs. 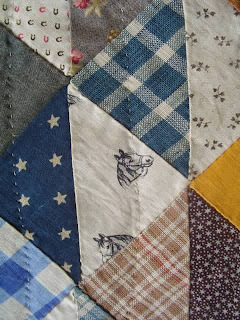 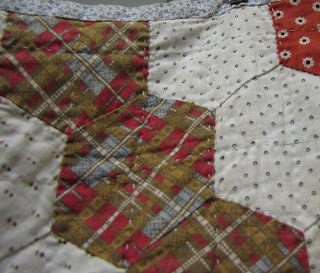 Don't forget to stop by Taryn's blog and see all the quilts (mainly antiques or inspired by antiques) on the online exhibit.